Yoko Ono, the widow of John Lennon, promoted peace throughout her life. She is a multi media artist with accomplishments in music, video making and sculpture. In 1987, she learned about a number of Mexicans who were seeking to enter the United States in the trailer of a truck. Apparently, the truck driver abandoned his trailer in the Sonoma Dessert. The migrants were locked inside the trailer and died. Every year, there are news reports of Mexican migrants who are found dead in the United States inside locked railroad cars or trucks. Seeking to find jobs or families in the US, instead they die in their travels. 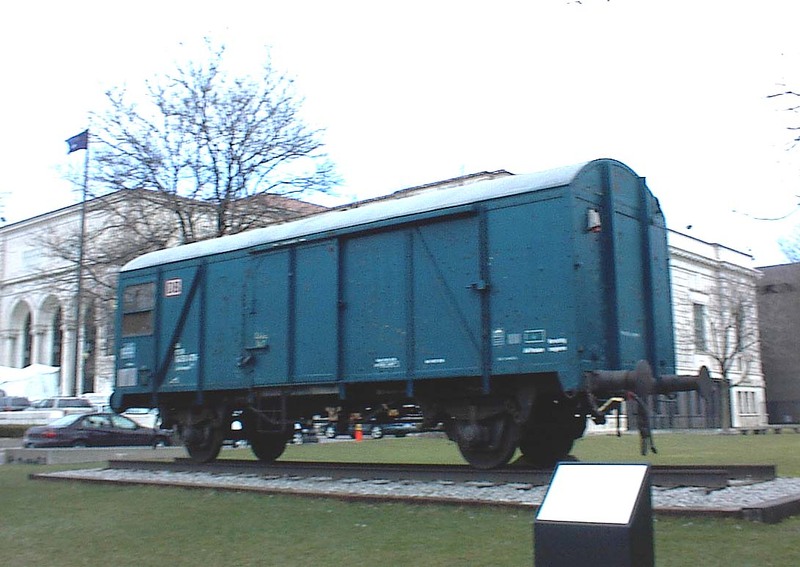 During World War II, the National Socialists in Germany used railroad cars to transport Jews and other minorities to concentration camps where many died. This is a thought-provoking sculpture, raising important questions about human cruelty to other humans. It is a German railroad car similar to the ones used during World War II. It is riddled with bullet holes, reflecting violence and murder. Yoko Ono composed mesmerizing music which is emitted from inside the box car. 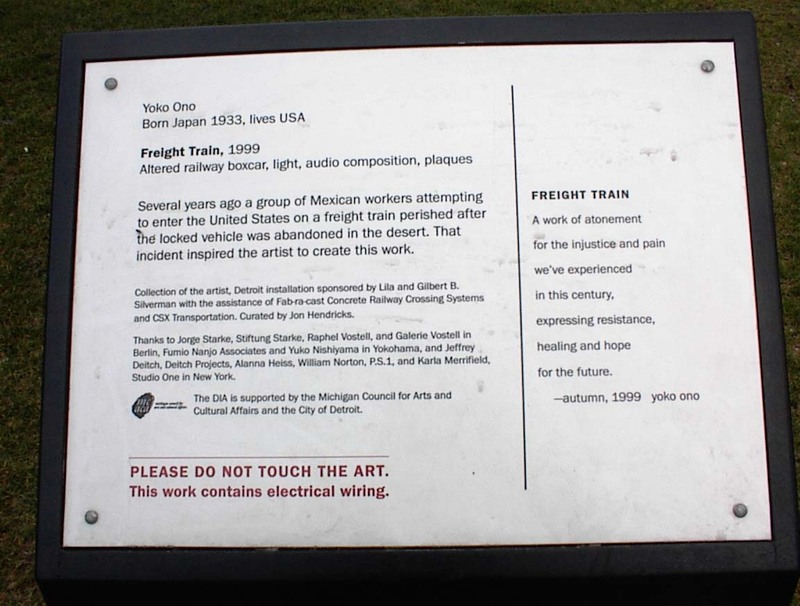 According to the artist, this railroad car placed on a short stretch of railroad track is “a work of atonement" for the injustice and pain we experienced in this century, expressing resistance, healing and hope for the next century. Yoko Ono was John Lennon’s second wife. Some commentators think that Yoko Ono was responsible for the break-up of the Beatles since they split shortly after she married John Lennon in the late 1960s. Their relationship was not necessarily a charming one since they separated for a span, but in 1975, she bore his child and then John Lennon devoted himself to his family. John Lennon was shot and killed outside the Dakota Apartments on New York’s Upper West Side on December 8, 1980.